TGIF and welcome September! In preparation for a nice long holiday weekend, today I thought I would share my favorite French Dip Sandwich Recipe! Once you see how simple it is to make, you’ll want to make it too! I’m always on the lookout for easy and delicious recipes. And so much the better if it can be made in the crock pot! 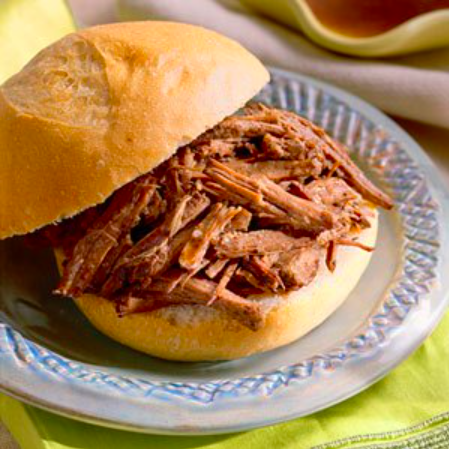 Originally I found this recipe in my Southern Living Slow Cooker Cook Book. I made it exactly as it was written the first time, but I felt like 1/2 cup of soy sauce was too much so I reduced it to 1/4 cup. So, you can tweek it to your liking. Here is the original recipe! Place trimmed roast in 5 quart slow cooker. Combine rest of the ingredients (except for the rolls of course.) and pour over roast. Add water to slow cooker until roast is almost covered. Cover and cook on low for 7-8 hours until roast is very tender and falling apart. Remove roast, reserving broth and shred beef with a fork. This recipe serves 12. I plan on making this recipe over the long holiday weekend. This would be a perfect dish for my family’s annual beach trip. Toss it in the crock pot and hit the beach!